Does your skin look like you don’t have time to care for it? Is it feeling sad and unloved? We feel you! Let us help by pumping seed oils and antioxidants into your skin for you! (figure of speech, you won’t all fit in our tiny office) We've got the basic run down on our natural, super nourishing skin savers. Instead of looking dull and dry, or peppered in pigmentation, you’ll be looking blooming beautiful in no time! We're often told that certain products are absolute 'must-haves' in every household. Have you every thought that your MooGoo serum could be one of them? Tammi, a 30-year old stay at home mum from Newcastle, recently got in touch to tell us that our Tamanu Oil is an absolute necessity for every Australian's bathroom cabinet, after if helped her elderly father overcome a wound he had struggled with for five years. Rosacea is a skin condition that causes facial flushing, redness and sensitivity across the cheeks, nose, chin and forehead. It can also cause redness and irritation on the scalp, eyes, ear and neck. People with fair skin and that blush easily are most likely to experience Rosacea. Do you love soft tanned skin without feeling dry and patchy, even in winter? Our Moogoo Brown Cows do. We call it a ‘natural tan’ because we use natural ingredients to give you a beautiful glow without damaging sun exposure. Read on for of our tips on achieving the perfect natural tan . . .
As you can imagine, we get asked a lot of skin related questions at MooGoo HQ. We've spent a lot of time understanding skin woes and more importantly, how best to solve them. We hope you find them useful! Some of the Customer Service Herd at MooGoo HQ have developed some serious MooGoo addictions. A peek inside their handbags shows us their particular MooGoo of choice! Luckily, their addictions are natural, non-irritating and leaves them with gorgeous healthy skin! MooGoo Toothpaste ("Moothpaste" as it's affectionately known) took quite a few years to develop. We've had more than a decade of experience taking care of people's skin, and we like to consider ourselves very knowledgeable when it comes to personal care products. But dental care was a whole new frontier for us! So we took our time. Did our research. Made sure that we created a product that was both effective and in line with our ingredient philosophy. As you can imagine, we learned lots along the way, and we thought we'd share these insights with you as well. MooGoo and Dental Care - What We've Learned! Because hair is made up of keratin and dead cells, it's unlikely that it will ever be truly healthy. But, there is an important link between the ingredients in your hair products and the overall health of your hair and scalp. We created our Hair Care Range for a family member who suffered from an unbelievably itchy scalp. and learned lots about hair and scalp health in the process. Here are our top tips to keep them both in tip top condition. It seems like the marketing of hair straighteners made curls seem uncool for a little while, but guess what? They're back! Our Curly Haired Herd share pics of their gorgeous curly crowns with us all the time, and there are whole forums devoted to celebrating and sharing knowledge about how to care for curly hair. Do you want clean skin? We’re almost certain that your answer is yes, given that clean skin is the foundation for a healthy, great-looking complexion. We’ve noticed a bit of a trend. It’s to do with MooGoo mums and dads, and what seems to interest them. This is based on an extremely scientific review of comments on a Facebook Post. Is MooGoo OK for babies? Yes! At MooGoo we only use ingredients that we're totally comfortable putting on ourselves, our loved ones, and our customers! Can I use MooGoo on My Baby? Melissa Le Man is a Fitness Model, WBFF Pro, and all around fit, strong and healthy woman. She recently started using MooGoo Skin Care, so we caught up with her to find out what she thought, and get a glimpse of her world. You might not have heard of Keratosis Pilaris, but chances are you know what it is. It looks like goosebumps on your arms and is sometimes called 'chicken skin'. What is Keratosis Pilaris And What Can I Do About It? It's not surprising that lots of people think MooGoo is made from Milk. 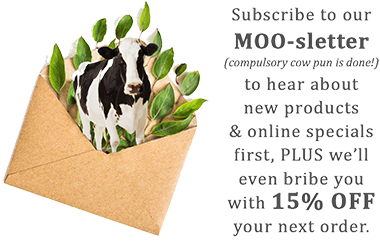 We're quite proud of our Moo-story, we love cows and we're not shy about using the occasional cow based pun! We even have our own range of plush toy cows! I'm Vegan - Can I use MooGoo? It would be a stretch (pun totally intended) to say that any topical cream can prevent stretch marks (aka "Striae gravidarum"). But don't worry, it's not all bad news.